Beginning Latin II proceeds in much the same way as Beginning Latin I. The book begins with a complete review of the concepts in Beginning Latin I, so that an older student can begin with this book. The book increases the pace of the lessons — introducing new concepts faster, — and lengthens the lessons. Where Beginning Latin I had 3-4 pages of exercises in a lesson, Beginning Latin II typically has 5-6. The first eight lessons of Beginning Latin II review Beginning Latin I. Then the emphasis of the book switches from verbs to nouns. The majority of the rest of Beginning Latin II gives the students a more complex understanding of the rules governing nouns. Whereas Beginning Latin I focused on the parts of the noun and verb (how the stem and endings fit together to make different words), Beginning Latin II focuses on the rules governing nouns in a sentence. Once again, rules are kept basic and exceptions are minimal. But students learn more rules associated with each case — they learn that each case can be used for several purposes. They learn to identify the possessive both by "of" and the " ‘s." They learn that the accusative is used both direct objects and for the objects of some prepositions. Near the end of the book, the student learns i-stems and the plural noun cases. They also learn the present subjunctive tense, which is called the "future possible." The students are better able to remember which tense they are dealing with when they remember that it is like the future but with a sense of possibility. They are here introduced to the idea of the subjunctive mood, so that when they are taught it formally they will already have a familiarity with it. Beginning Latin II also asks the student to perform synopses of their verbs. They have to give a particular form of the verb in each of the four tenses (e.g. "ponere" in the 3rd person singular: ponit, ponebat, ponet, ponat). This is the ultimate test of understanding of the rules that govern verbs, as the student has to move quickly between the tenses, identifying the stem, the particular change necessary for the tense, and the correct ending. At the end of Beginning Latin II, the student has observed, understood, and memorized an impressive amount of vocabulary, irregular verb tenses, and rules governing nouns and verbs. They are able to translate increasingly difficult sentences both from Latin-to-English and English-to-Latin using their system of breaking down the parts of the sentence, identifying the correct vocabulary words, finding stems, and adding correct endings. Every translation is done methodically, writing down each step, so as to build a habit of understanding the parts of the sentences and not simply guessing the right answer. 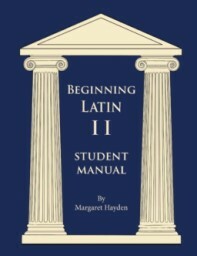 For more information, please see books.modg.org: Beginning Latin II.